UNITED NATIONS, May 4 2012 (IPS) - Come May 12, South Korea will host its largest single landmark event for the year – an achitecturally-glittering Expo 2012 – continuing a 161-year-old tradition going back to the first Great Exhibition in England in 1851 showcasing the steam engine. The world fairs that followed included the 1876 international exhibition in the U.S. city of Philadelphia, which focused on the telephone as its thematic centrepiece, and the 1885 exposition in Antwerp, Belgium, highlighting the automobile. The primary theme of this year’s international exhibition, hosted by one of Asia’s leading economic superpowers, is “the living ocean” and the protection of the world’s maritime resources. According to the United Nations, 60 percent of the world’s major marine ecosystems are either damaged or overexploited. The last world expo, held in 2010 in Shanghai, China, was based on the theme “Better City, Better Life” and the next expo, scheduled to take place in Milan, Italy in 2015, will focus on the cultural heritage of that city. 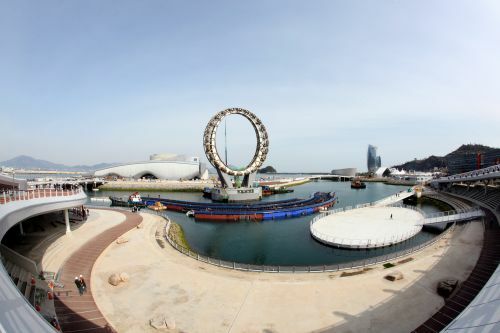 Located in the coastal town of Yeosu, home to Korea’s major ports, industrial complexes and national marine parks, Expo 2012 will showcase the achievements of the 21st century in marine science technology. Described as a “green expo”, the exhibition’s environmental theme runs parallel to the U.N. Conference on Sustainable Development (also known as Rio+20) scheduled to take place in Brazil mid-June. The United Nations, which has set up a giant pavilion, the second largest after Korea, is playing a key role in Expo 2012. With more than 70 percent of the earth’s surface covered in oceans, says the United Nations, the lives of human beings are intimately linked to oceans. And the world body aims to advance the sustainable management of oceans, coasts and small island developing states which face the threat of being wiped off the face of the earth due to sea-level rise and the degradation of the global environment. The Expo organisers say they have established environmental guidelines for the first time in the long history of world exhibitions: carbon-neutral, eco-friendly buildings powered by solar and ocean thermal energy. The government of Korea has invested over 1.9 billion dollars on the exhibition, which runs May 12 through Aug. 12 this year. At the same time, it is also spending nearly 11 billion dollars constructing new roads, installing a high-speed train service between Seoul and Yeosu and building a massive tourism infrastructure in the coastal city. The event is expected to attract nearly 11 million domestic and international visitors during the three-month fest. This, he pointed out, will spur tourism, promote employment and upgrade Korea’s least developed region, the site of the exhibition, located at the centre of the south coast abundant in marine resources. The event will bring the public and private sectors together, with the participation of some of Korea’s leading industrial companies, including Daewoo Shipping and Marine Engineering, with Korean traditions linking the latest technologies. The Expo has attracted 105 countries, 24 U.N. and other international organisations and Korea’s top conglomerates which all have built their own state-of-the art pavilions. All the major cities and provinces of Korea are also represented at the three-month exhibition. At least 50 countries, including the United States, China, Japan, Germany, France and Spain will have individual pavilions. Also, 50 developing nations have designed joint national pavilions classified into three clusters: the Pacific Pavilion, the Atlantic Pavilion and the Indian Ocean Pavilion.